Home One on One Lecturers From Village Girl to Vice Chancellor: Prof. Olive Mugenda’s Story. From Village Girl to Vice Chancellor: Prof. Olive Mugenda’s Story. Prof. Olive Mugenda is the former vice-chancellor of Kenyatta University, Kenya’s second largest institution by student numbers. For years she knocked on the doors of management, quietly but very persistently. When they opened, she entered enthusiastically – and made a major impact. Mugenda rose through the academic ranks, from tutor to one of the most challenging jobs in East Africa’s biggest economy. Now past her years at the helm of the university, she has indeed been be busy building a legacy. But she seems to have already done that, judging by a raft of achievements she has pushed through at the institution. Kenyatta University is on a roll. For instance, in the Webometrics global rankings of universities by web presence, Kenyatta overtook Kenya’s private Strathmore University and closed the gap on local leader, the University of Nairobi. Kenyatta has been steadily climbing positions to reach number 18 in Africa and 1,925 globally. Mugenda believes the improved Webometrics ranking – which she said reflects the adoption of modern research, teaching and publishing methods – are an indication of Kenyatta’s rising activity and status. Under Mugenda’s watch, student numbers have tripled and satellite campuses have been established. The university is in the process of constructing a state-of-the-art referral hospital at the cost of KSh 8 billion (US$95 million), which is more than the institution’s annual budget. The 500-bed hospital will be the country’s first fully fledged university hospital. In 2009, Kenyatta University surprised the country by venturing into the mortuary business, having constructed a 50-body morgue at its school of applied human science, which also trains morticians. The huge expansion and growing commercial activities of the university – the latter aimed at raising funds needed to cope with growing student numbers – have brought into focus the management and leadership acumen of Kenya’s first woman leader of a public university. Mugenda’s story is of a village girl who rose from obscurity to the upper echelons of Kenya’s university leadership. She spoke to University World News about her journey through academia and her experiences as an African university leader. Please tell us about your background, and how you came to be an academic. Growing up in a village in Kikuyu constituency, an hour from Nairobi, Mugenda had no early plans to teach, let alone become the boss of a higher education institution. After obtaining a bachelor of education (first class honours) from the University of Nairobi, she obtained masters and PhD degrees in family studies and consumer economics at Iowa State University in the United States. “I had never thought of being an academic until I got a first class honours. At that time, a first class was such a big achievement and it helped me get to scholarships for a masters and PhD. “That’s how I was introduced into the world of academia,” said the mother of two boys and two girls, who have taken after their parents – her husband is Professor Abel Mugenda of the University of Nairobi – and gone full-throttle into studies. 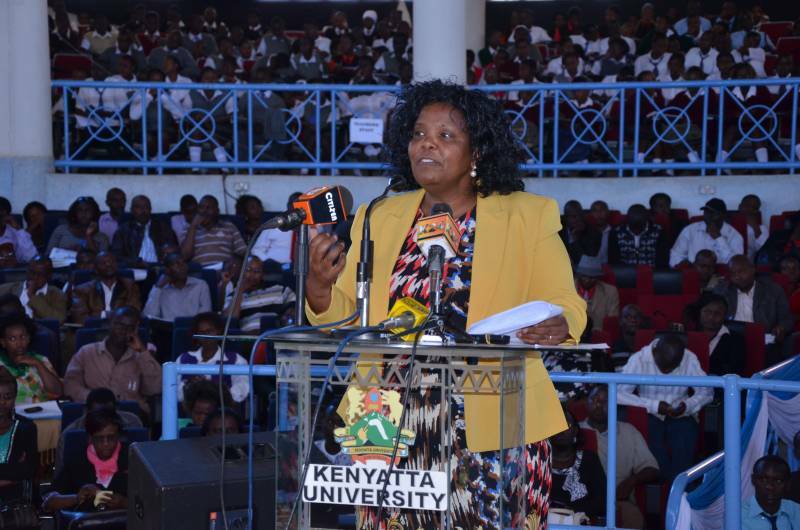 Mugenda returned to lecture at Kenyatta University. Professor Leah Marangu, who was at Kenyatta and is now vice-chancellor of Nazarene University – one of Kenya’s leading private universities – encouraged her dive into academia. It was the beginning of an illustrious career. Mugenda became a lecturer, and specialised in women’s education, home economics, statistics and research methodology. She contributed towards the restructuring and diversification of the home economics curriculum at Kenyatta University, placing greater emphasis on emerging topics such as environmental sciences, public health and HIV-Aids management. She rose to become head of department, dean of faculty and deputy vice-chancellor of finance and planning, “which exposed me to a lot of administrative and financial issues”, before beating three other (male) candidates to land the top job. So how does Mugenda manage the university, and what drives her? “I am results-oriented. I don’t work just for the sake of work. It is dedication that has brought me this far. I have put in systems and directorates such that it is not just me who decides. At least 100 senior managers and chairs of departments make key decisions every day,” she once said. She has survived many battles that could have cost her employment, especially in 2009 when she faced a parliamentary probe over a student strike. Some MPs called for her removal, saying she had mishandled the boycott, but Mugenda stood firm in defending her leadership. “That was the most difficult time for me since taking over this job,” she recalled. “When I took office, I was naive. I thought all I needed to do was to work hard and things would fall into place. Being a woman made the job even tougher. Mugenda became vice-chancellor at a time when Kenyan society did not have faith in the ability of women to lead. How would you describe your leadership style and approach? “You must put in time, you must be passionate otherwise you won’t go far. You must be in control. You must be disciplined. You must set targets, as what gets measured gets done,” she explained. Mugenda places great store in being honest. “I really can’t stand people who are dishonest. Because if you don’t say the truth – well, I find it very difficult to deal with people who are dishonest. Another thing I can say is that I work hard. I really put in time. “Lastly, I like being innovative and creative. I don’t think KU would be where it is today were it not for the innovative ideas and creativity. And most of them must come from the leader. If you wait for people below you to come up with those ideas, then it will not happen. The whole question of integrity is also important, Mugenda continued. “You can be a very hard-working leader, a very good leader, but if you don’t have integrity, all that is wiped off. These are things I look for, even when hiring. “Are you a person who is self-driven? Do you want a job just because you want a good title and salary? Or are you really looking for targets? Are you a team player? Again, you can be very hard-working, but you can’t do everything alone. How did you primarily spend your day? Mugenda rises early, between 4.30 and 5am “depending on the work I have”. She labours away at home for around two hours, and gets to work between 7.30 and 8.00am, “because of that working at home first. The role of deputy vice-chancellor, Mugenda said, was an eye-opener regarding what it takes to manage a large institution. It has become much larger – in terms of student numbers, infrastructure and the network of universities with which Kenyatta is associated – under her leadership. Since she took over in 2006, student numbers have tripled, from 15,000 to around 70,000 this year, backed by some 1,000 academic staff. Her goal was to raise student numbers to more than 60,000 by the time she calls it a day. The number of schools has expanded from six to 18 and the number of satellite campuses has grown from zero to 13. “When I was deputy vice-chancellor, my biggest assignment was to come up with a strategic plan – which I was later to implement. “One decision we made was to diversify and get to the people, and that’s how we ended up opening the 13 satellite campuses and open learning centres which now take care of over 15,000 of our students,” she said. Expansion, Mugenda explained, has been driven by rising demand for higher education in Kenya. Student demand and competition between universities is piling pressure on institutions to grow and is forcing them to rethink fundraising and infrastructure plans. “While the government has offered the right policy framework for the expansion of higher education, the pressure is on university heads to raise funds and enrol the growing number of students,” she said. Many more Kenyans are seeking additional qualifications such as MBAs and others are rushing for first degrees. Latest statistics show that student enrolment has jumped by 65% over the past, from 120,000 in 2008 to 276,349 at the end of 2013. Economic Survey 2012 shows there are at least 67 universities – local and foreign – operating in Kenya, up from around 30 institutions five years before. With such a surge in numbers, the financing matrix has been getting complicated for public university heads, since the government can no longer keep up with the demand for subsidies. Mugenda said that in 2006, Kenyatta University had a budget of KSh3 billion (US$38 million), 70% of which was funding from the government. Currently, the university has a budget of about KSh7 billion (US$83 million) and only 45% comes in as government subsidies. The focus now is on researchers and lecturers writing grant proposals, to help build the university’s research funding, Mugenda said, adding that Kenyatta University has set up a directorate to drive this effort. “Quality of learning and funding challenges have been a big concern,” she said. Nevertheless, Kenyatta has been thriving in this environment fraught with challenges, which is a tribute to Mugenda’s leadership. Kenya is in the process of implementing the Higher Education Bill 2012, which will among other things see the formation of a powerful regulator. The changes come at a time when Kenya is looking to expand its higher education system to cope with rising demand for learning opportunities. With universities struggling with quality – they are weighed down by overflowing classes, strained facilities and a shortage of lecturers – they are finding it difficult to admit more students. “We must keep growing the facilities. Universities must raise more funds from commercial activities to cope with this. It’s happening in Africa. It’s happening globally,” Mugenda said. What are the two or three words that most describe you? In a few words, what are your major strengths? Efficiency, discipline and a team player. Impatience with people who don’t meet their targets. Do you have a golden rule? A life motto? How would your personal assistant describe you? She would say I am firm and someone who demands excellence. I have worked with her for over 10 years and she knows me very well. Hand work and honesty. I hate pretenders. Your favourite book or author? I read a lot of John Maxwell books, because they talk about attitudes and winning. I listen to a lot of gospel music, especially the vernacular ones. I used to go to the gym. Now I don’t. On Saturday I come to work. On Sunday I go to church and then come to work, or stay with family. Mugenda is the author of several books, and so also devotes some of her ‘off-time’ to writing. Next articleSocialite Vera Sidika to Re-join Kenyatta University!